Care about refugees? Then listen to them. First survey shows Syrians are fleeing from Assad, not Isis. Nearly all want to go home. The results are crystal clear. Syrian refugees don’t want to stay in Europe. But unless politicians start listening to why they’re fleeing and what needs to happen for them to go home, many more will come. Contrary to what you might read in the papers, it’s not the media-grabbing brutality of Isis that most people are fleeing from. It’s the much larger scale, state organised violence of the Assad regime that is driving most people from their homes. 70% are fleeing the violence of the Assad regime and its allies (32% Isis, 18% Free Syrian Army, 17% Al Nusra, 8% Kurdish forces). All armed groups have been involved in detention and disappearances in Syria, but none to the extent of Bashar al-Assad’s government, as thousands of leaked images of torture in state prisons prove. 86% say kidnapping or arrest was a threat to their personal safety. 77% of them fear it from the Assad regime, 42% Isis, 18% Al Nusra, 13% Free Syrian Army and 8% Kurdish forces. It might seem that the people struggling in boats across perilous waters or jumping over barbed wire fences really want to be in Europe. But they don’t. Syrians want to go home to the country they know and love. The problem is with the violence raging they can’t. 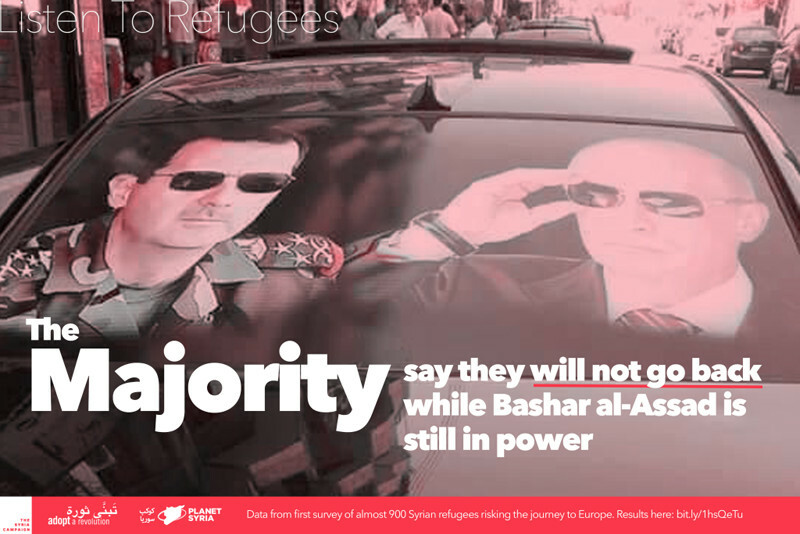 While Russia and others are asking countries to unite with Assad to fight Isis, it’s important to note that the majority of Syrian refugees will not go back while he remains in power. Syria needs peace and an end to dictatorship. The vast majority of refugees said they feared Assad’s barrel bombs – the improvised metal barrels packed with explosive and scrap metal that government helicopters drop from miles up in the sky onto civilian neighbourhoods. These barrel bombs and other aerial attacks are the number one killer of civilians in Syria – the barrels alone have killed more than 2,000 children since the UN banned them in 2014. They routinely destroy hospitals, schools and homes. Syrians living under the barrel bombs find it difficult to forget the terror, even once they have fled to safety. To stop the refugees pouring over Syria’s borders we have to stop the bombs. More aid isn’t the answer. 73% said barrel bombs were a threat to their personal safety. 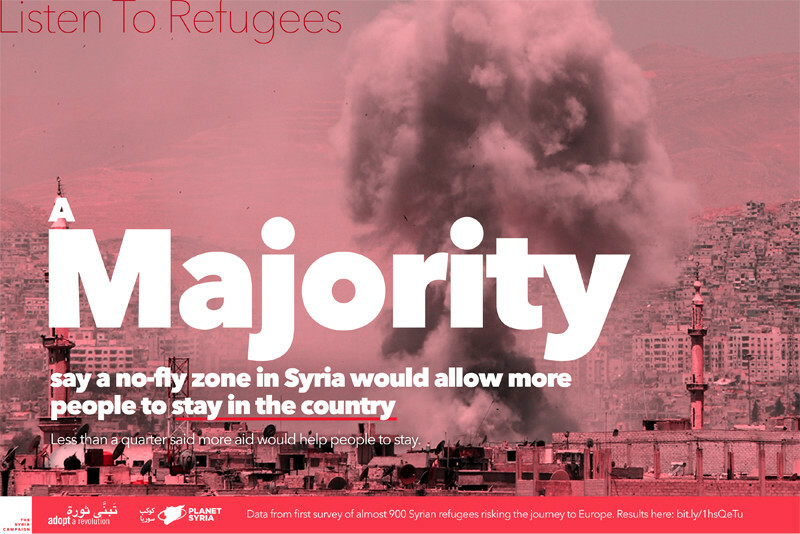 58% said a no-fly zone would help more stay in Syria, only 24% said the same for increased aid. So much has changed in the last four and a half years in Syria yet still an overwhelming majority of Syrian refugees hold Bashar al-Assad responsible for today’s events. 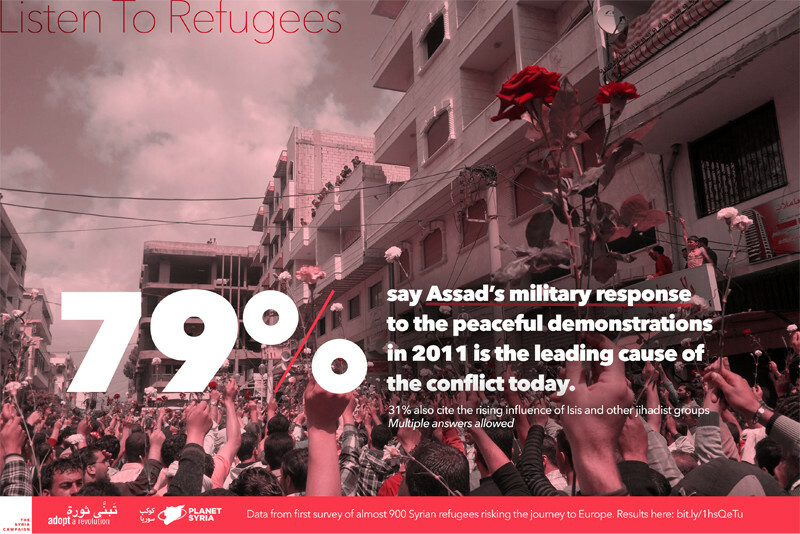 According to most of those surveyed, Assad’s decision to use military force against peaceful protesters demanding freedom and dignity in 2011 is the cause of today’s violence. 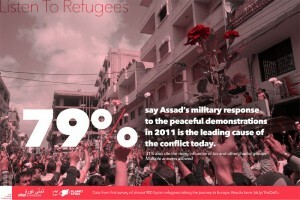 79% said it was the Bashar al-Assad’s military response to the demonstrations that led most to the situation today. 1. Enforce a stop to the bombs. There are various initiatives from no-fly zones, no-bombing zones and safe zones which while all different in their implementation, would prevent the biggest killer of civilians in Syria today: Bashar al-Assad’s aerial attacks and barrel bombs. Europe needs to get serious about stopping the bombs. 2. Push for a peaceful transition of power away from Assad. There is no military solution to the conflict and there is international agreement that a transition to a new government is the only way to end the violence. 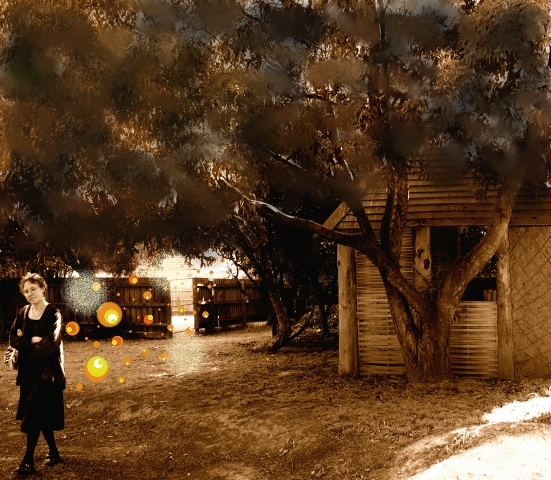 The longer that takes, the more people will be driven from their homes. It goes without saying that Europe should open its borders to those fleeing war – that’s a human imperative. European leaders need to realise that unless they do more to constrain the violence of the Assad regime and make more effort to stop the war, the waves of refugees will not stop. The UN has predicted another million will be displaced in Syria before Christmas, and that was before Russia joined in the fighting. To solve the refugee crisis, we have to stop the Syria crisis.